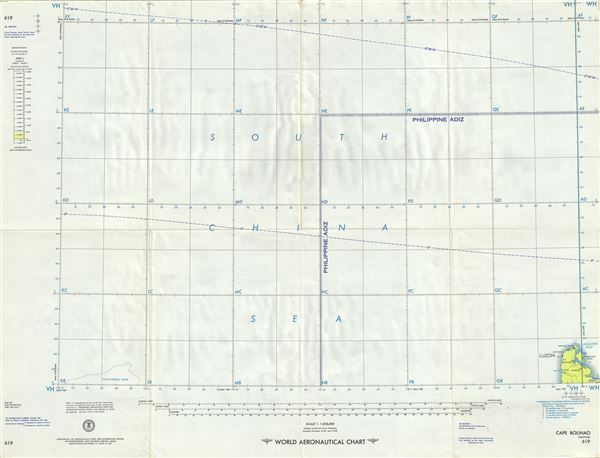 This is a fine 1957 U.S. Air Force Aeronautical chart or map of Cape Balinao in northern Luzon, Philippines. It features the western portion of the Pangasinan province of Philippines from Santiago Island south to Lingayen in the lower right quadrant with the South China Sea to its north and west. The map notes important towns, coral reefs, roads, bays and other hydrographical and topographical features essential for the air pilot. Verso of this chart features legends and a world aeronautical chart index. This chart was published by the Aeronautical Chart and Information Service, U.S. Air Force, and was issued as chart no. 619. This is the fourth edition revised to August 1957.